I just came up with this fast review activity the other day. It turned out to be a huge success, and really got the boys speaking Spanish! I cut out 6 shapes out of 6 different colors of construction paper (star-estrella, circle-círculo, square-cuadrado, triangle-triángulo, rectangle-rectángulo, oval-óvalo). 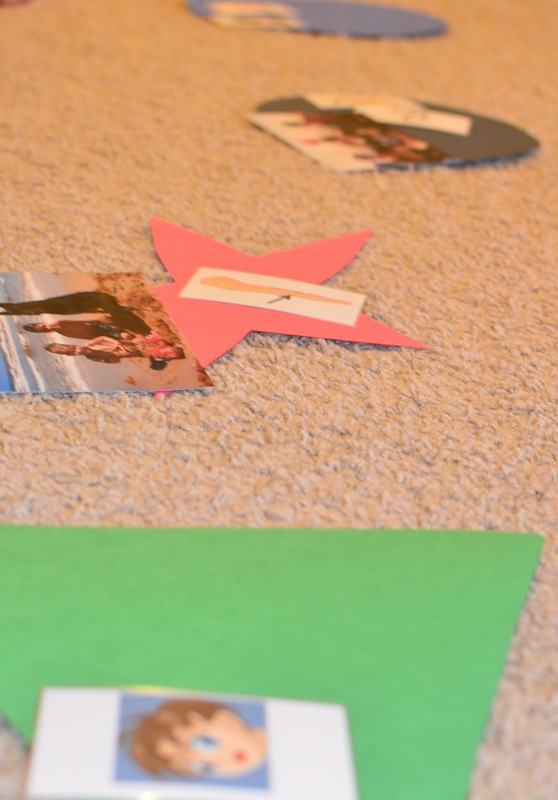 On top of the shapes I placed pictures of family members as well as our body parts flashcards. I would say, "¿Dónde está _____? (either one of the family members or a body part). The boys would take turns finding that object. Once they found it they had to say, "__________ está(n) en _______ (shape) _________ (color)." For example: "¿Dónde están los abuelos?" "Los abuelos están en el óvalo azul." It only took them a couple of times practicing before they could say the sentence without help. It ended up being, not only a great way to review previous vocab (family, body parts, shapes, colors), but also to practice grammar and speaking.